Honest, I'm going to complete these ... soon ... honest! Here is a solar telescope I am working on. It will be an 300cm F.L. folded refractor (beautiful Fraunhofer doublet by lenscrafter Jan Sugalski) with a 2x Televue Barlow lens, perched on an equatorial mount. I use the 2x televue Barlow lens to expand the light cone to f/30, directing a cone of pre-filtered (red) light to a Daystar 0.6 A T-Scanner solar filter. These are the optical components of my telescope: a 20 cm f/15 achromat figured by Jan Sugalski; a 15cm pyrex flat (1/10 wave) and a set of Zeiss othoscopic oculars, selected by Mike Palermiti for optimal performance from 4mm to 25 mm in focal length. My spectrohelioscope, i.e., a telescope for visual observation of the Sun in a single pure color of sub-Angstrom bandwidth, is built around a commercial monochrometer and custom 25cm f/45 quartz objective lens (i.e., FL ~ 33 feet). 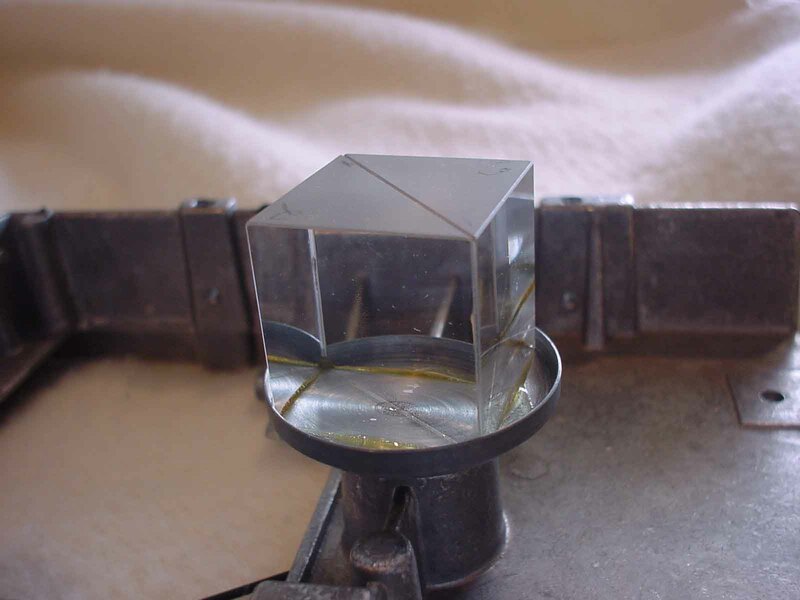 The lens was figured to 1/8th wave by Jan Sugalski from a GE fuzed quartz blank (very difficult; quartz is hard, and the final tests required looking at the diffraction rings through binoculars at the FL of the lens). I have designed my spectrohelioscope around a commercial monochrometer. 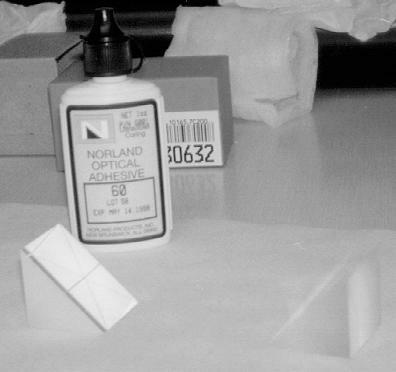 The Anderson prisms were made by Norlan 61 cementing two diagonal prisms, then mounted on adjustable spindles (tolerances are ฑ0.001 inch). Quartz singlet objective lenses are used because quartz has a low linear coefficient of expansion = 0.55 ตm/mบC improved on by Zerodur at .05ตm/mบC (which is not clear enough for lenses), but much better than 3.2ตm/mบC for Pyrex, 7.1ตm/mบC for BK7; and 8.2ตm/mบC for F2. I'm using PC disk drives to power and synchronize the image synthesis from the Anderson prisms (the slits are on opposite sides of the monochrometer) though I may experiment with a belt drive. The heliostat is built around a 12.5" reference flat from Davidson, with a stepper motor drive, directed through one of the three singlets, and reflected off of a 3.5" 45บ cold mirror (made of Cervit) to eliminate IR and UV light (which I don't want in my eyes or in the monochrometer) prior to processing the beam through the spectrohelioscope. I've relied extensively on Veio's "The Spectrohelioscope" for design guidance. 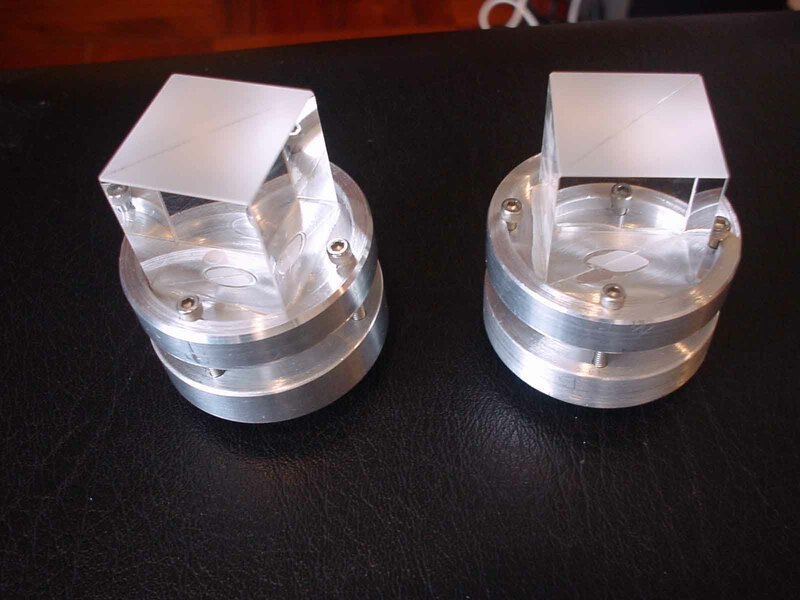 I have two additional quartz objectives of FL 9 feet and fl 18 feet which are now being placed in machined cells. 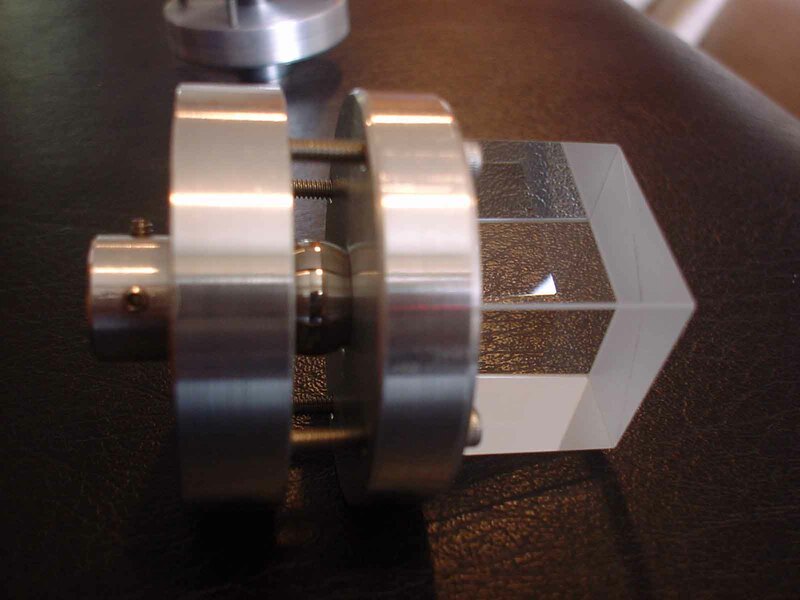 Three objective lenses are required since the slits in the monochrometer require that the image be formed before the light reaches the eyepiece. The set of three objectives will provide 4", 2" and 1" diameter images of the sun, respectively. The solar image is synthesized from the 1/2" 1-dimensional slit frame by two Anderson prisms, controlled by a set of electronically syncronized PCW motor circuits. We both have a space problem. In the past what I simply did was to set up my instrument just one time Get the spacing of the wood piers ok, check the focusing of the optics, whatever. On the concrete patio I marked where to put the three wood piers thereafter. This saves much set up time and frustrations. For you at your apatment, you set up your instrument, mark the locations of the piers, thereafter it is all easy. An observatory is nice, but I really do not feel a lose of same, nor a need for such anyway. When you first start observing, it is a real thrill for about the first 30 days, then you become morre particular about picking the days to observe. If there is not much on the sun, you not likely set up and observe. Anyway, you got to get something in operation, just a good long f.l. 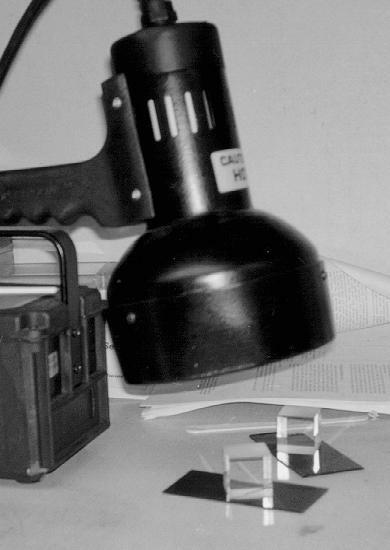 spectroscope will give you thrills. For clarification, an equatorial mounting with a RA drive for the SUN, total gear reduction ratio is 1440:1 ratio with one rpm motor. For a sidereal RA drive for the STARS, the ratio is 1436:1 with a one rpm motor.We got to keep it simple, really not difficult for the amateurs what to do if they just get certain basic facts. And they save a lot of money. Not need a lot of fancy electronic stuff, latter is ok but expensive.